Alethea Marti is a linguistic anthropologist with a PhD/MA from UCLA and a BA in Cognitive Science from UC Berkeley. 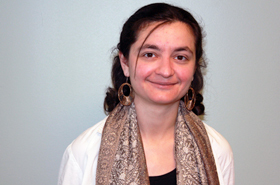 She conducts qualitative discourse analysis for Dr. Bonnie Zima’s Mobile Health for Mental Health (MH2) pilot, as well as translating and piloting the Spanish version, Salud Móvil para Salud Mental (SM2). She is also working under Dr. Zima on an overview standardized outcomes measures used in community child mental health care, contracted by the state of California. Her research interests include discourse and narrative analysis, families’ development of understandings about mental health care, and cultural and linguistic communication issues for Limited English Proficiency immigrant parents. Dr. Marti is certified as a volunteer Spanish/English medical interpreter through UCLA’s Employee Volunteer Interpreting Program. Mobile Health for Mental Health, MH2™, is a web-based application that optimizes early stimulant medication treatment for children with Attention Deficit Hyperactivity Disorder (ADHD) through improving communication between the parent, teacher, and prescriber. Pilot-testing is underway at Augustus Hawkins, a community mental health clinic that serves predominantly low-income children and families in South Central Los Angeles and at the San Fernando Child and Family Guidance Center. The MH2 project is currently being piloted in both English and Spanish. Archangeli C, Marti FA, Wobga-Pasiah E, Zima BT. Mobile health interventions for psychiatric conditions in children: A scoping review. In Health Information Technology for Child and Adolescent Psychiatry [Special Issue]. Child and Adolescent Psychiatric Clinics of North America. 2017 Jan;26(1):13-31.